Once dismissed in the Western world as an impossible myth, the world highest free standing, snow-covered Equatorial Mountain has now been charted and climbed, and stories of her resident man-eating spirits are relegated to the realms of folklore. 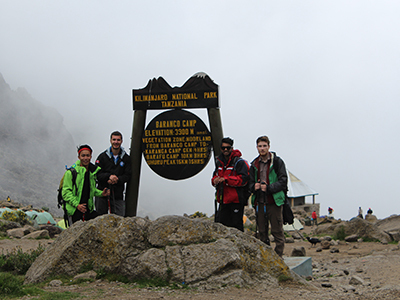 But Mount Kilimanjaro continues to preserve a mysticism that defies all recent knowledge of her slopes. Images of the towering snow-covered cone rising majestically from fertile green foothills have become a powerful motif for this land of extraordinary extremes. Few could deny a very distinct sense of awe when the cloud clears to reveal a glimpse of the towering peaks, shining bright in the equatorial sun. 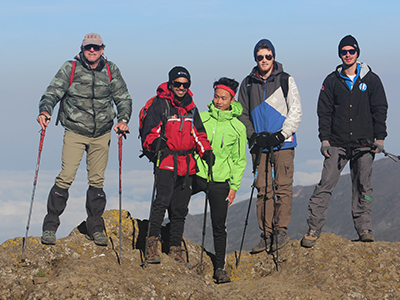 Kilimanjaro represents a powerful life force for the local Chagga people and all those who have made their lives around this mountain, providing rich volcanic soils for agriculture and an endless source of pure spring waters. One of the most amazing aspects of the mountain in the present day is the accessibility of its peak to climbers with no mountain climbing equipment or real previous experience of scaling such heights. 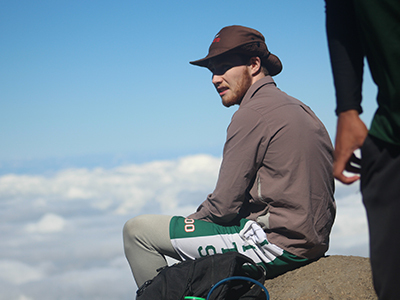 The number of climbers has escalated to over a thousand a year during the last century, quite a development since Hans Meyer made history as the first European to scale the highest point of Kilimanjaro in 1889. 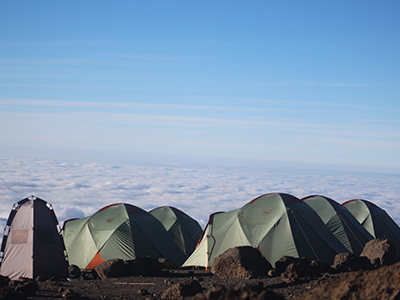 Kilimanjaro is the highest mountain in the world that every day tourists can climb, although it remains a considerable feat of human endurance. The breathable oxygen at the top is less than half the amount than is common at sea level, and climbers cover at least eighty kilometres on nothing but their own two feet over the five days it takes to reach the top and return. The increasing number of climbers each year has made it necessary for the National Park to insist that all climbs are pre-booked, and passes are no longer issued at the last minute at the park gate. With most of the old lowland forest now cultivated and settled, the first experience of the mountain environment begins with the dense vegetation of tropical montane forest that surrounds the mountain between 1850m and around 2800m. Cloud condensation mainly gathers around the forest, so this area is regularly damp or drenched with rainfall, creating an intriguing mass of plant life and running rivers between endemic tree species such as the formidably tall Olea Kilimandsharo, that grows up to 30 m.
The area of heath just beyond the tree line also enjoys a relatively misty and damp environment as cloud clings around the density of trees. This is covered with heather and shrubs such as Erica Arborea and Stoebe Kilimandsharica, and a number of dramatic looking Proteas. Then from around 3,200m a wide expanse of moorland extends beyond the heath and the cloud line, so that here the skies are generally clear, making the sunshine intense during the days and the nights cool and clear. The climbing incline remains gentle, but thinning oxygen provides less fuel to energise the muscles and can dramatically slow the pace of walking. Hardy endemic species of Giant Groundsels (Senecio) and Lobelia (Deckenii) towering up to 4 m high thrive in this moorland zone and give the landscape a strangely primeval atmosphere. Even higher, beyond 4,000 m, this sensation intensifies as the landscape develops into a more bizarre alpine desert with sandy loose earth and intense weather conditions and temperature fluctuations so dramatic that barely any plant species survive other than everlasting flowers, mosses and lichens. 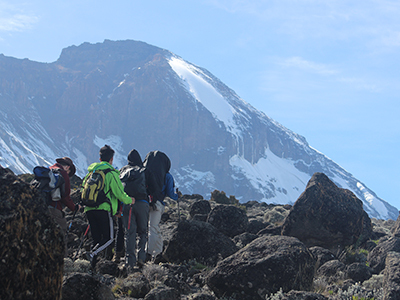 Only the odd lichen survives beyond 5000 m, after Kibo Huts and beyond the Saddle, where the landscape is predominantly rock and ice fields as climbers experience the final steep push to the summit. The easterly routes, Marangu, Mweka, Loitokitok and Rongai all converge west of the saddle near Gillman Point, between the peaks of Mawenzi and Kibo. 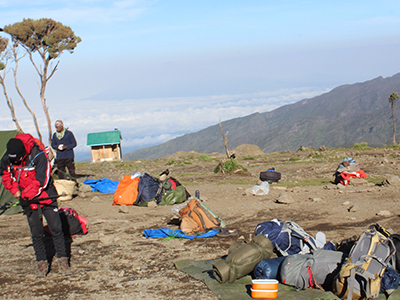 Kibo crater is roughly circular with an inner cone extending to 5,800 m, (100 m lower than the summit at Uhuru Peak).